I really love this jacket - its marked down to $79.99 - my local store still has redlines at 40% off today, but if yours does not, you can use the 30% off friends and family sale. They have 16 and 18 in a nice khaki color online still. On another note, I am sitting here watching the Project Runway Finale, and have wanted items from both of the men's collections. But Mila's collection looks fresh out of NY and Company. Not what I would expect on the finale. I really like collars like that - I think they're so much more interesting (and prettier!) than 'normal' collars. 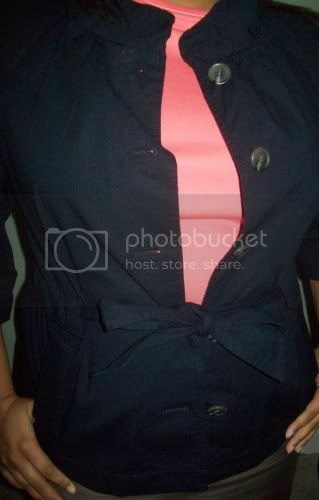 I love that you tied the jacket belt in a bow too, I barely ever think to do that and I just make a boring knot! Love your jacket. Have a great weekend! Case - thanks so much for stopping by! I added your blog to my "Blog Roll" and out you in my reader too! Corie - Come on down hehe.Or maybe I will just bring this to Atlanta! :-)There is alot more shopping out your way!